Address: Oldenburger Ring 3 02829 Markersdorf Germany. 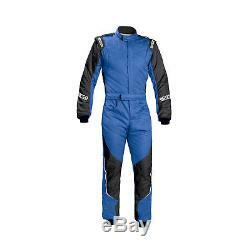 Sparco Energy RS-5 Race Suit blue/black (FIA homologation). Sparco Energy RS-5 Race Suit (FIA homologation). Race Suit from the latest collection SPARCO. Energy RS-5 is a lightweight three-layer suit which offers superior fire protection, breathability and comfort. Multiple stretch panels for comfort. Leg length - inside (cm) F. Leg length - outside (cm). The listing is automatically managed by IdoSell Shop , a system that takes extra care of listing only products that are actually in stock. The item "New Sparco Energy RS-5 Race Suit blue/black (FIA homologation) 58" is in sale since Wednesday, August 15, 2018. This item is in the category "Sports Mem, Cards & Fan Shop\Fan Apparel & Souvenirs\Racing-Other".